Just like the cane toad - Queenslanders adapt to their environment. The google definition for the word ‘Queenslander’ is pretty lame. Something about a journal and some architecture. I much prefer Anna Bligh‘s definition. I was listening to our Queensland Premier on the telly today and my heart swelled with pride. Not only by the incredible job she’s done in handling such an emotionally mammoth task, but the words she spoke during one of her two hourly press releases reminding us who we are. The past couple of days the television, twitter, facebook, newspapers have been inundated with images and news about the horrific floods sweeping throughout parts of Australia. There really are no words to describe the devastation and loss by this flood disaster. But Aussies have banded together and shown the world strength, determination, resilience, compassion and a hard yakka attitude. 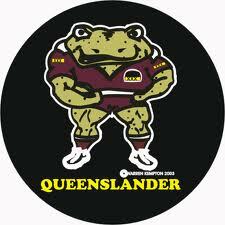 I think it is time we came up with a new google definition for the word ‘Queenslander’, cause I know I’m very proud to be one! “It’s not far from the top to the bottom.” (in relation to losing everything). “Don’t cry over something that wouldn’t cry over you.” (in relation to losing ‘stuff” verses people). Stormy ways & Godly ways? From my last post, I talked about tons of rain on the Sunshine Coast. This post is mainly my viewpoint on God’s role in storms and disasters which can unfortunately affect people in a very negative way. This is a really difficult question as it is such a sensitive issue and people (including Christians) can disagree depending on their experiences. I believe that we live in a fallen world where there is sin and tragedy and heartache. Of course, this was never God’s intention for us, as when he made the world He said “it was good.” (Genesis 1). Then we have this darkness called Satan and it describes what he is up to in 1 Peter 5:8 ‘Stay alert! Watch out for your great enemy, the devil. He prowls around like a roaring lion, looking for someone to devour.’ God didn’t intend for a world of evil when He made it. He was hoping that Adam and Eve would choose life. But God does give us choices in our lives that end in consequences, just like Adam and Eve were given choices in the garden and decided to choose a path that God did not want for them. Just like a loving parent teaching their child the rights and wrongs of life, when the child choses to do something bad, there are consequences to get that child hopefully back on to the right path. Basically, if you shut God out of your life how can He be there for you? It is pretty clear from God’s Word (the Bible) that he doesn’t take disobedience lightly, that He is serious! This shouldn’t be a shock to us as He has plainly outlined it numerous times in his Book. What do we expect? Do what we fancy and get away with it? Imagine if that were true! I believe that when God created us, He wanted us to have fellowship with Him. He didn’t want to make robots. It is the same as being married to the love of your life. It is such a wonderful feeling knowing that your husband/wife chose you. They could have chosen anyone, but they loved you and chose to be with you. Then imagine it differently – you are married to the love of your life because you made them love you. They never had a choice. Which way is more fulfilling and loving? God wants us to choose Him, He yearns for us to choose the right path that He has set out for us that leads to Him. There will be storms. The Bible tells us that God causes the sun to rise on the evil and the good. Not just the good. And He sends rain on the righteous and the unrighteous. Not just the unrighteous. Of course, this verse is not just talking about literal sunlight and rain, but about the metaphorical light and rain as well. We will have sadness. We will have afflictions. People with faith still have to struggle with life. The difference is: People with faith don’t have to go it alone. God wants us to lean on Him in difficult times. He calls us to glorify Him when the roads are freshly paved, and when they are full of potholes. Then the going gets tough, the faithful lean on God. That’s the way He wants it to be. He wants us to hope in Him, and it is this hope that will renew our strength, that will give us the power to soar like eagles, to run like champions, and to walk with courage and perseverance. It’s sometimes difficult to swallow, but the Bible even tells us to rejoice in the storm. Sounds almost silly to consider rejoicing when a tornado approaches our home, threatening to destroy everything we hold dear, but it is precisely in the face of such strong winds that we are called to rejoice, because it is these storms that force us to lean upon God.